America's 1st Macaroni and Cheese Restaurant. Well, sadly, it is official. Our Cleveland location will be closing on Friday May 13th, 2016. We graciously thank all of our customer, friends, and family who supported us. Remember the good 'ole days of eating grilled cheese, tomato soup, & delicious mac & cheese? We do! JB MACK adds a pinch of nostalgia & a dash of comfort to every meal. More about JB MACK. Our Macaroni & Cheese can be served in a delicious bread bowl. How cool is that!?! The mac is great, but eating the cheesy bread bowl is definitely the best part. Step 1: Pick your fillings. Step 2: Pick a cheese sauce. NEW GRILLED WRAPS Take a tour of JB MACK Cleveland is Closing! Lunch never tasted this good! 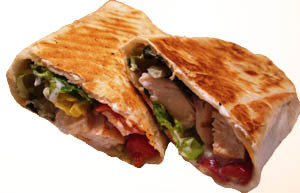 Our new grilled wraps are here!! We even have a mac & cheese wrap. It's simply delicious! Check them out here. Ever wonder what a mac and cheese restaurant looks like? Well check out cool videos and pictures of a JB MACK. Click here for a tour. Well, sadly, it is official. Friday May 13th will be the final day for JB Mack (in Cleveland!). We had a nice run.More about the location. Join our social network for ￿friend-only￿ coupons, discounts, and news!